Administration area of Featherston Camp, 1917. 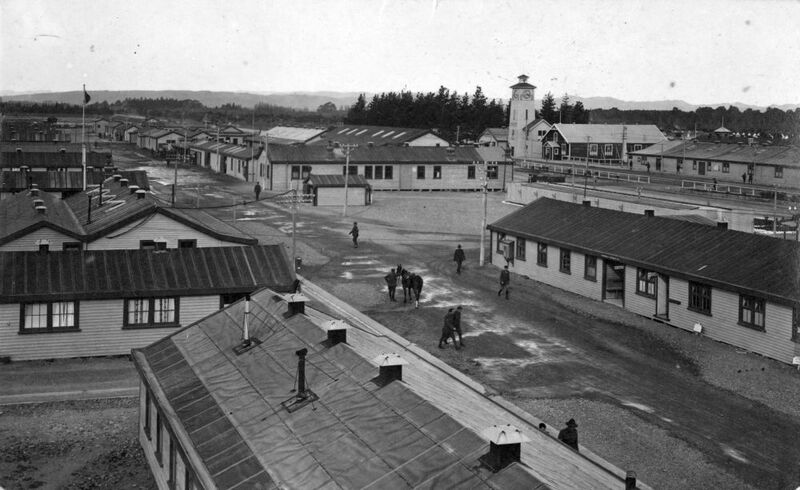 Featherston Military Camp, New Zealand’s largest training camp with over 250 buildings, helped prepare at least 60,000 men for service in World War One. The camp was connected by a rail spur to the main Wellington-Masterton line. Infantry usually trained six to eight weeks in the south Wairarapa, while mounted riflemen and artillerymen did virtually all their training at the camp. In addition to 90 barracks (called hutments in New Zealand) there were religious institutes, a canteen, soldiers’ club, hospital facilities, stables and shops. Men drilled and worked at the training grounds close to camp, and route marched and rode further afield. There were associated camps at Canvas Camp, Tauherenikau and Papawai. At times there were almost 10,000 troops in the Wairarapa. When training finished at war’s end, the camp was used briefly as an internment camp, tuberculosis and venereal disease hospital and an ordnance store for equipment from the war. It was dismantled in the 1920s, some buildings being reused in the Wairarapa and some moving to other defence bases. Others were demolished for the timber. Only concrete foundations remained by 1930. 243 soldiers died during the camp’s operation, with over 160 dying during the influenza epidemic in late 1918. The site, retained by the Defence Department, was used as a Japanese prisoner of war camp from 1942-1946, with about 800 inmates. 48 Japanese and one New Zealander were killed in a riot in February 1943.